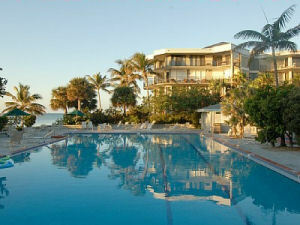 The 1800 Atlantic vacation rental property features some of the best amenities in the entire Florida Keys. Our accommodation is licensed for both nightly and monthly condo rentals. We offer a great alternative to the small hotels and inns located on Duval street. We offer very competitive rental rates, especially when you can share the cost of our home rental with your vacationer friends. Our modern surroundings will make the Historic Inns pale in comparison with what we have to offer. The 1800 Atlantic resort will give you the feeling of being on a remote Caribbean island with it's beautiful tropical landscaping. One of the amenities that comes with our vacation rental is the resort's gigantic heated pool that is located just off our private beach area. 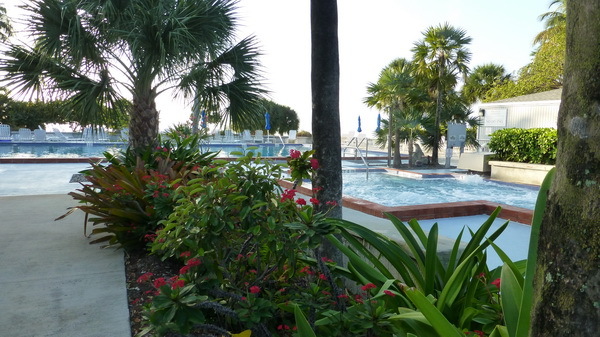 Next to the pool we have one of the largest hot tubs in the Key's. We also have a convenient location next to the islands best beach, Smathers Beach. We are centrally located and not far from Duval street and Mallory Square. Why settle for a cottage rental or bed and breakfast when you could have tennis, racquet ball, and saunas all which are included with our romantic house rental getaway. Our condo rental even comes with a fully equipped kitchen with all the features of home, which gives you the option to eat in and save money if you so choose. If you're looking for a great escape our condo rental will insure a memorable vacation with it's generous space and luxury that you just won't find at many other vacation rental properties or hotels. Don't leave your vacation to chance by staying at one of the large hotel chains where you are just a number. Our ocean front condo rental is privately owned and managed which assures our renters that they will receive our personal attention and attention to details. We pride ourselves on our quality lodging here at our 1800 Atlantic resort and we look forward to having you be our guests. Another important item to consider when making a vacation rental choice is a transient license. To legally have nightly or weekly rentals in Key West, property owners must be in possession of a transient license that is issued by the city. The city does check and will enforce it's rental laws. Vacationers are in jeopardy of having their vacation ruined if they are caught renting a vacation home from an unethical property owner that does not posses a license. Coconut Palms is fully licensed for both short and long term rentals. Key West has plenty of entertainment and attractions to satisfy every vacationer, including a number of beaches that you may want to visit during your stay. 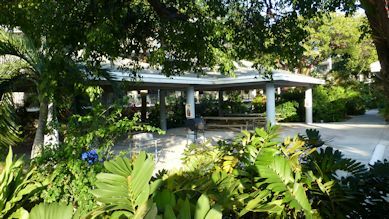 Be sure and check out our Key West Beach Reviews and our Beach Location Map Guide before you venture forth. Their are numerous fantastic Key West restaurants, fishing tournaments, art galleries, shopping centers, museums, water activities and Key West bars /night clubs, including world famous Sloppy Joes and the Green Parrot to name just a few. Weddings are also a very popular attraction to the island. There are a host of Key West wedding planners available to help you plan your big day. The most famous and popular of all the events is Fantasy Fest. Fantasy Fest is a week long celebration that party goers consider the Mecca of all parties. The other two events worth checking out are the middle of summer Hemingway Days or the November, Jimmy Buffet Parrothead Meeting of the Minds festival.